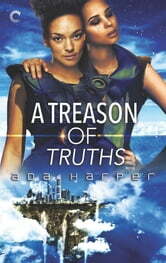 A Treason of Truths is an action packed, science fiction, f/f romance story which revolves around the relationship and actions of Empress Sabine and her spymaster Lyre. Summarised by the author as a ‘Queer Girl Die Hard on a floating city,’ the book more than lives up to this description. Not only does the book feature espionage, royal intrigue, and international politics, but it features a range of multifaceted characters. Mix all this with an intense and emotional romance between Sabine and Lyre, and you have an amazing and entertaining read. Please note, I was lucky enough to receive an advance reader copy of this work in exchange for an honest review.